Hello and Welcome to my website! I am very happy that you landed here, please allow me to share some of my Watercolors with you. Commissions are welcomed and most everything that hasn't already sold is for sale. Free to friends, full price to relatives! I am adding new work all the time so please check back occassionally. Check out the Gallery Page for some of my work. I recently found a good printer here that can make high quality prints on watercolor paper, so if you like something, even if it says 'Sold', please let me know. The prints will generally be a little smaller than the original to allow for maximum detail. © Copyright of all images is retained by the Artist. 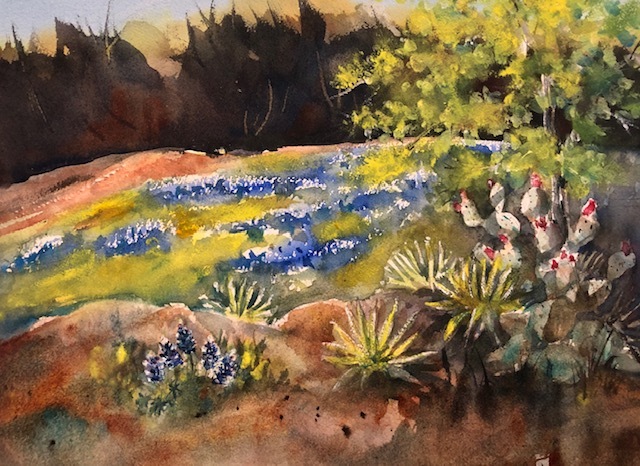 The State Flower of Texas is difficult to capture with watercolor, their small petals lend themselves to painting opauely or reserving the white parts with masking, a tedious endeavor, I chose to paint the foreground ones by painting around them with the backgoround color and added touches of white acryliic. The distant ones were left abstract and were painted only with a dry-brush technique.